Choosing the right baby bag or backpack for your little ones can be so overwhelming. There are so many choices out there. In recent years many great non-toxic alternatives have become available. These products are being produced without the use of nasty chemicals, such as BPA, PVC, Phthalates and Lead. These chemicals are detrimental to our health and the development of growing children. If you’re interested the information that informed my decision to buy a non-toxic alternative check out the links on the bottom of this post. When I was still pregnant I began doing my own research for the safest non-toxic baby bag. I ended up going with the SoYoung Charlie Diaper Bag. The unisex style is great for both myself and my partner to use and it has many compartments for all those baby essentials you need to travel with. Now as my little one is about to start daycare I have begun looking at the best non-toxic backpacks for her. So here is the result of my own research of products that are available to the Australian market. I hope it helps you find a safer alternative for you little family too. 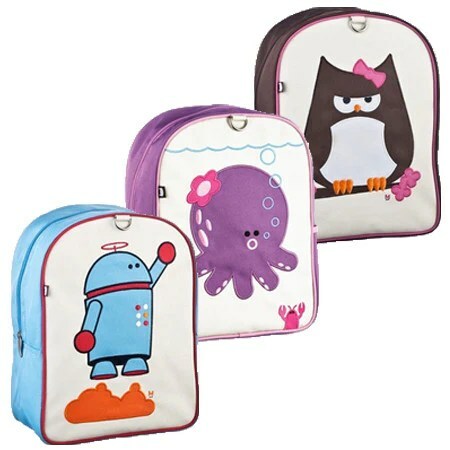 I have also begun researching lunch bags and boxes so stay tuned for a future post for more non-toxic alternatives. Free of PVC, Phthalate, Lead and BPA. Free of PVC, Nickel, Azo dyes, Cadmium and Phthalates. Use recycled materials and organic cotton to manufacture goods. Free of BPA, Phthalate, AZO, Lead and PVC. Other diaper bags in the range are free of all listed except PVC. Meet or exceed ASTM, CPSIA, EN71. Features: 2 conveniently placed interior bottle pockets for easy access; Includes extra long changing pad in 2 Red Hens red dot pattern (26″L x 12.5″W); Easily convertible straps for use on shoulder or stroller; 6 interior pockets and 2 exterior pockets keeps hard-to-find items organized and at your fingertips in seconds; Water resistant backing for quick, hassle-free cleaning; Stylish and color coordinated red zipper closure keeps your personal belongs safe and secure; Fasten the elastic strap under the signature red button quickly for those in-a-hurry time crunches. Can be purchased with Toddler Backpack Lunchbox as a set. Free of PVC, AZO, BPA and Phthalate and Lead. Medically endorsed, no child labour, recycled PET fabric. Free of BPA, Phthalate, AZO, Lead-free. Meet or exceed ASTM, CPSIA, EN71. Coordinates with Apple and Mint Lunch Bags. Features: Gloss coated material with carry handle; Interior zippered pocket; Two side pockets for drink bottles, Big enough to fit nappies, wipes, a change of clothes, and of course a toy. Free of PVC, BPA, and lead, non-toxic, earth-safe, & reusable. Free of BPA, PVC, and Phthalate. Conforms to CPSIA, ASTM, and EU standards. Free from PVC, Phthalates, BPA and lead safe. Conform to CPSIA. Features: Roomy main compartment fits our Lunch Box, Bento Box, “Cozy Can” Water Bottle add-ons and a few small toys; Interior pocket; Laminated front easy to wipe clean; Beautifully embroidered details; Heavy-duty stitching insures sturdy seams; Strong, custom-shaped metal zipper pulls easy for kids to manage; Top haul loop for easy bag hanging; Write-on name tag on back; Machine-wash alone in cold, gentle cycle with zipper closed. Line dry. Free from PVC, Phthalates, BPA and lead safe. Coordinates with Beatrix New York Lunch Box. Phthalate free. Meets CPSC safety requirements and is FDA compliant. Free of PVC, Phthalate, BPA. Non-Toxic Certified, Recycled Materials, Zero waste. Features: Main compartment spacious enough to hold a standard binder and lunch box in addition to a couple of favorite library books and small toys; Interior pocket; Front laminatedl panel pocket; Heavy-duty stitching insures sturdy seams; Strong, custom-shaped metal zipper pulls easy for kids to manage; Fitted chest clip; Top haul loop for easy bag hanging; Write-on name tag on back; Machine-wash alone in cold, gentle cycle with zipper closed. Line dry. Hi Sonyo, thanks for leaving a message. I’m so happy someone else is getting use of my research! I still have to decide what we are going to go with. I’m liking the Wildkin bags. Thank you so much for your post! I’ve been searching and searching to find a “non toxic” diaper bag. I actually ordered the forma from Skip Hop, but returned it. I almost ordered the Charlie bag last weekend, but I am a little concerned about the EVA laminate lining. Did it off gass/smell at all? Baby is due in a few weeks, so I won’t have time to let it air out. Also, did it test “undetectable” for the PVC, Phthlates, lead, etc.? Thanks again! Hi Kelly thanks for stopping by. I didn’t find any smell in my Charlie bag at all. I don’t remember smelling anything on the changing mat, but I lost it a long time ago, so I use Bambooty changing mats. The only thing that annoys me about my bag is that the velco straps that connect to my pram come apart, due to the velco unsticking. We never complained to the store we bought it from, as it was about 8months after we bought it that it started happening regularly, plus we didn’t think the brand would send it to Austalia. I now just use my Joolz pram back with my Joolz pram, which also doesn’t have any smell. From memory they were also free of these toxins. SoYoung say that they bag is free of PVC, Phthalate and Lead, so I would assume there isn’t any trace but I recommend asking the brand directly. I often email brands directly to find out more info and usually get a reply within a couple of days. I find American brands to be quite responsive. Hi, I really liked this entry! “Our Anywhere I Go diaper bag backpack made with Nylon – 230 D with jersey backing . As well regarding the your other inquires that information is actually consider propitiatory information . Thanks for your comment. Sorry I was alway so I didn’t reply until now. I haven’t heard of this bag before but I will look into whether its available in Australia. When I was looking for Ergobaby carrier myself I never came across it. It sounds really nice though. Yes the So Young Charlie is very expensive. I got it for my baby shower luckily. I do find that I use my Joolz baby bag more though since it attaches to the pram. I believe that one was free of nasties since I inquired also about the pram at the time, but I didn’t include it on the list since its a pram accessory. Skip Hop looks great though and would have been my other choice. I do really appreciate backpacks now I’m a mum.